With a lace pattern inspired by the pine cones that adorn the boughs of our graceful evergreen trees, the Hemlock Ridge Beret will keep you warm and cozy on any midwinter stroll through a piney woods. 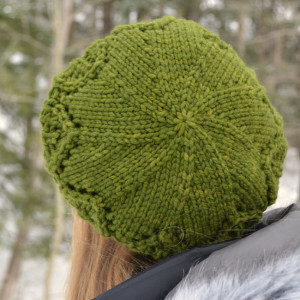 The beret features a lace “pine cone” patterning topped by a spiral decrease at the crown. And with no end to the big chill in sight, you’ll be wanting to keep your cozy quotient up as well. Hemlock Ridge is knit with one squooshy and oh-so-soft skein of bulky weight, Dream In Color Groovy. Groovy is a 100% superwash merino wool with a well defined twist and a lovely depth of color. It’s also available in lots of delicious shades. For my sample beret, I chose Shiny Moss and used about just about 106 yards. The Hemlock Ridge Beret is designed to fit an adult head size of approximately 21” – 23” (53 cm – 58 cm). The blocked beret circumference is approximately 31” (79 cm). This downloadable, PDF pattern has been professionally tech edited and test knit to reduce the potential for error. The stitch pattern is charted, but the pattern features complete written line by line instructions so the ability to read a chart is not necessary to work this pattern. 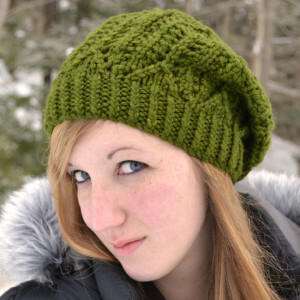 So get knitting and then go for a hike, in style, with the Hemlock Ridge Beret. Full pattern details for the Hemlock Ridge Beret can be found here.